As mentioned before, there was a royal wedding going on in Istanbul last Friday as Prince Muhammad Ali of Egypt and Princess Noal Zaher of Afghanistan tied the knot at the beautiful Çirağan Palace. 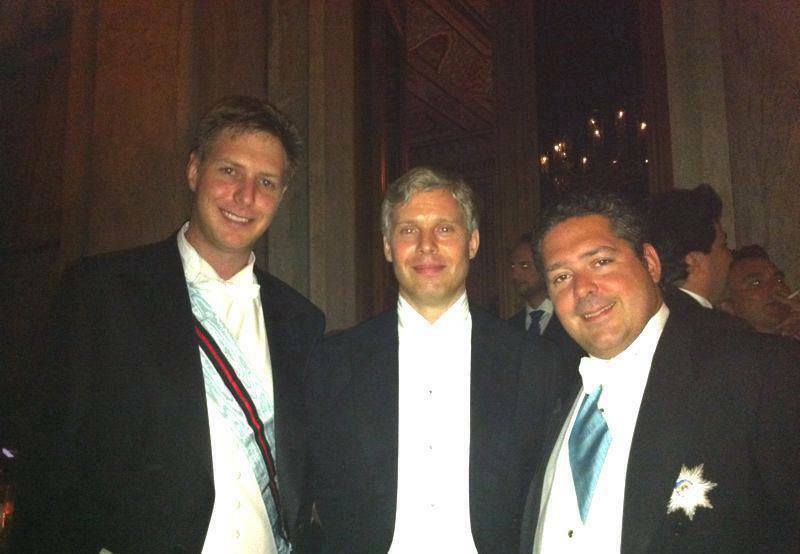 Reportedly, the oldest son of the last King of Egypt, Fuad II, and the granddaughter of the late last King Zaher Shah of Afghanistan met last year in the city on the Bosporus, more precisely at the the wedding of Prince Rudolf of Liechtenstein, youngest and most low-key of the three sons of Prince Philipp and Princess Isabelle, and his Turkish born wife née Tılsım Tanberk. And so it is no big surprise that (at least) Prince Rudolf was also among the guests at the nuptials happily posing for a picture with Prince Leka of Albania (left) and Grand Duke Georgi of Russia (right). Update: It seems that the prince's parents, Prince Philipp and Princess Isabelle, were also in attendance as was his wife Princess Tılsım.